The new state-of-the-art model among industrial scanners, the PM8300-DK suits all applications in logistics and production. Its abilities have been greatly extended with a display and a 16-key alphanumeric keypad. Additional information, such as item descriptions, is displayed and unreadable bar codes or quantities can be entered manually using the telephone-like alphanumeric keypad. 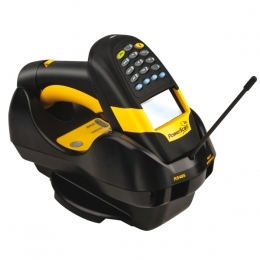 The PM8300-DK can thus be used for applications that usually require expensive mobile data collection devices. The PM8300-DK reads even badly printed or damaged bar codes quickly and accurately without any problem. The patented Datalogic »Green Spot« that confirms successful scans directly on the code is also integrated. Whether using point-to-point or a network application, data transfer with a frequency of 433 MHz ensures a wide range of possibilities.